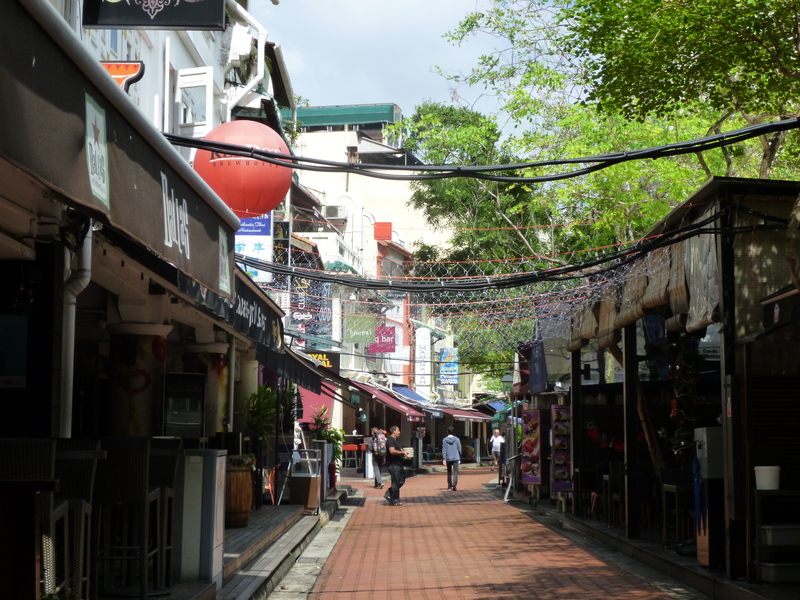 My little trip around Boat Quay began with a red bean-flavoured ice cream sandwich and ended with a bottle of water. It took me through an eclectic mix of seeming opposites, in the span of some minutes–tight lanes flanked by stirring eateries and wide grey vistas overlooking the Singapore River, white-collar workers and holiday-goers, ancient history represented by the Asian Civilisations Museum on one bank and the bustle of urbanisation from the modern high-rise buildings on the other. 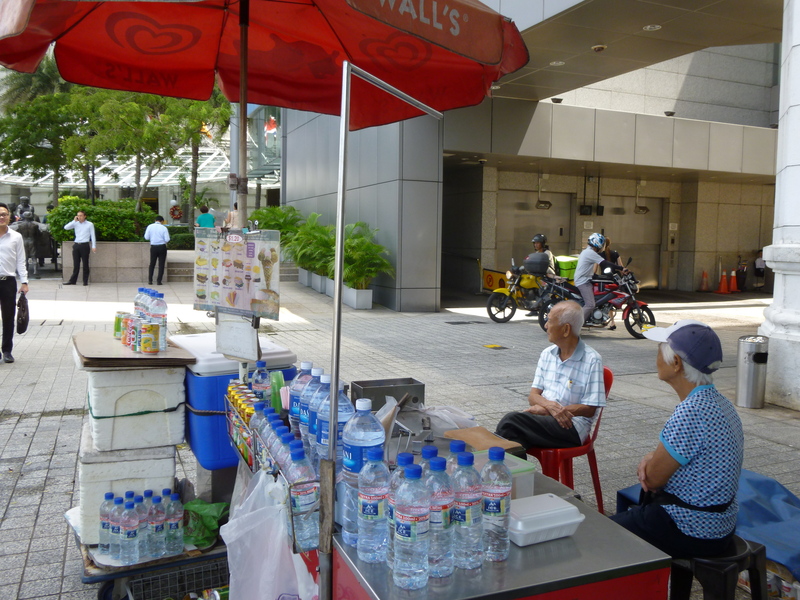 The path was marked at points by carts where vendors were hawking the ubiquitous potong (‘cut’ in Malay) ice cream, which seemed, ironically enough, to be the one thing that has remained more or less unchanged over the course of decades. The thick rectangular blocks of coconut milk ice cream which would be deftly sliced and served between a pair of wafers, in a plastic cup or between pieces of psychedelic sliced bread only for a dollar has always been popular with the young and old, locals and tourists alike. 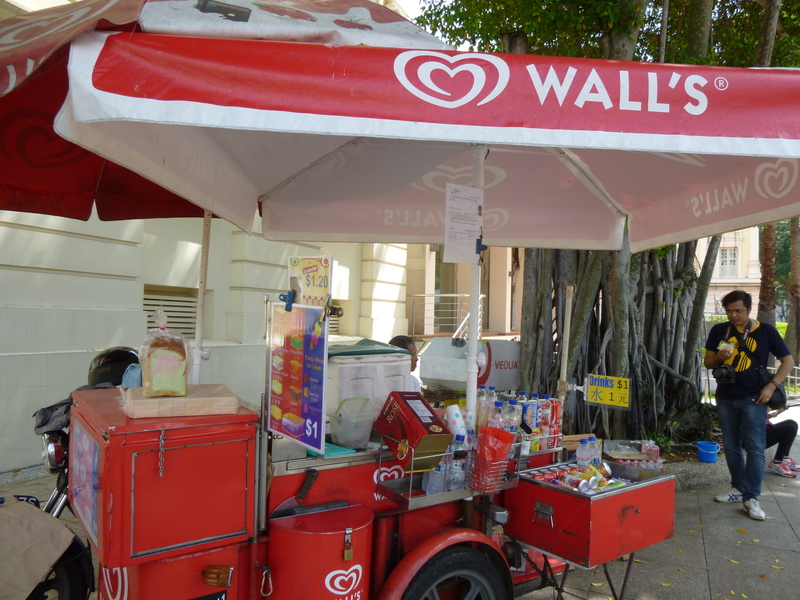 The selection of flavours–a standard list including mango, raspberry ripple, red bean, peppermint, chocolate chip and durian among others–never changes no matter where you go, and neither do the appearance of the carts marked by their wide red Walls umbrellas. So it was from sitting next to these ice cream carts that I got to have the best view of the diversity of the crowd frequenting Boat Quay. Red-faced Western holidaymakers toting maps and backpacks, eager Thai tourists brandishing selfie sticks and office workers in their suits and ties would flock to the same place for a bite of ice cream. And the ice cream sellers, as well as others who had also stopped by to watch the crowd, seemed to be in the best position to witness the tide of life that surges past the sleepy Singapore River. True enough, I was regaled by some interesting tidbits of wisdom from our conversations. “I come here at 9 in the morning everyday. Then I stop work at 5–it’s tiring to be working for so long, isn’t it. I didn’t go to school, so I went to the construction industry. Then seven, eight years ago I began selling ice cream. I have kids, they’re all grown up already. I sell ice cream to pass the time, so I don’t get bored. What’s stress? Stress is just made up. If you study hard and get good grades your parents won’t complain, so you don’t feel any pressure. But when you’re lazy and don’t do well your parents will nag–nah-nah-nah-nah–and so the lazy ones will say, ‘I feel so much pressure’. Those who feel pressure are just lazy. Be careful: from the ages of sixteen to nineteen it’s the easiest for one to be tricked. How? Sit down here and I’ll tell you. If you mix with bad company, your friends will bring you to the bar, bring you to nightclubs, and you feel like it’s fun. Then you drink and drink until you become tipsy. Then they’ll take advantage of you. You won’t know what happened because you’ll be drunk, and when you wake up you’ll be in a daze until you see what they did to your body. This is why you should never drink at a nightclub. Branded goods can be a danger. You see some girls who carry branded goods around, right? But their families may not have the money. They get them by selling their bodies. $200 for a girl who hasn’t been slept with before, $100 or $150 for the others. They can make $300 a night just by sleeping with someone twice. Some girls in Vietnam, China, Thailand; they do it for the money. A rich boyfriend isn’t necessarily better. Those who are rich, they just want to play around with you. They bring you out for a drink, and you think they are good to you. They don’t actually like you, they just want to toy with you. Then when you’re drunk, you don’t know what they do to you, they’ll take advantage of you. They spend and spend, and then they go pok gai. Once you’re around someone long enough, you can see their character and know who to trust. So you should always choose someone who is dependable. “I’m here for leisure. I met a friend earlier to deliver goods and now I come here to relax. There’s good scenery here. 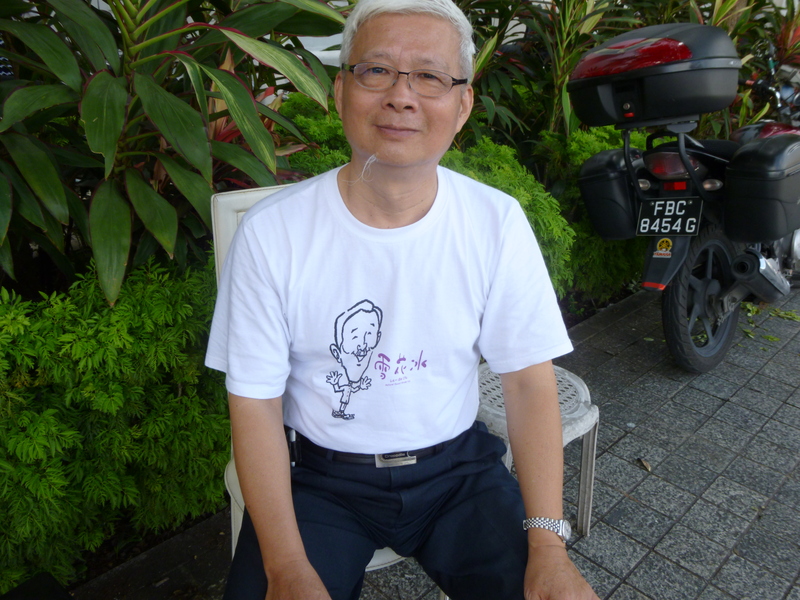 I’m Taiwanese, I got my PR status 15 years ago. I come here for business every two years and the rest of the time I’m in Taiwan. Sometimes my family comes here to visit, so when they’re around I help to look after the grandchildren. My children are both grown up–one’s 37, the other is 35. My daughter got a government scholarship and went to a university in England, and after that she served a bond with the government. Now both of them are married and have children, so I can spend time doing light work. I’m a supplier to the supermarkets around here, Sheng Siong and others. I also supply to supermarkets in Malaysia and Thailand. Sometimes I’ll bring my family on holiday to Malaysia, and once we went to Australia. You can tell what people are here for by their footsteps. See that girl? She’s walking slowly, you can tell she’s here for leisure. Maybe she’ll set up the tripod and take pictures. That man is here for work, because he has hurried footsteps. That young man on the scooter over there is delivering goods, in the black pack on his shoulders. You must be here just to walk around since you have time to talk to me, yes? Before I came here, I created the snow ice dessert. We opened branches in Japan and Singapore and sold off the rights to other companies. Mei Heong Yuen got the idea from us. This is why I wear the shirt. Got it for $15 from Japan. I spent my life being busy until I was 60, and now I have other people do my work for me while I stand aside and watch! 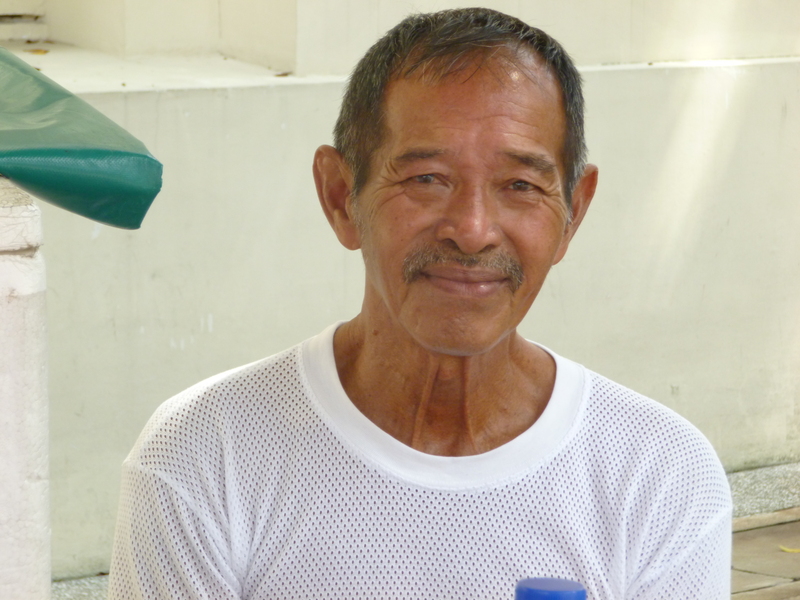 In Singapore the retirement age is 65, so you have to work until then. No choice. People who feel pressure are those who think too much. Those in white-collar jobs; their minds are full of thoughts. As long as you study hard, listen to what your teacher tells you, you’ll do okay. Once you leave university it’s that time of life where you have to work hard to save up money.